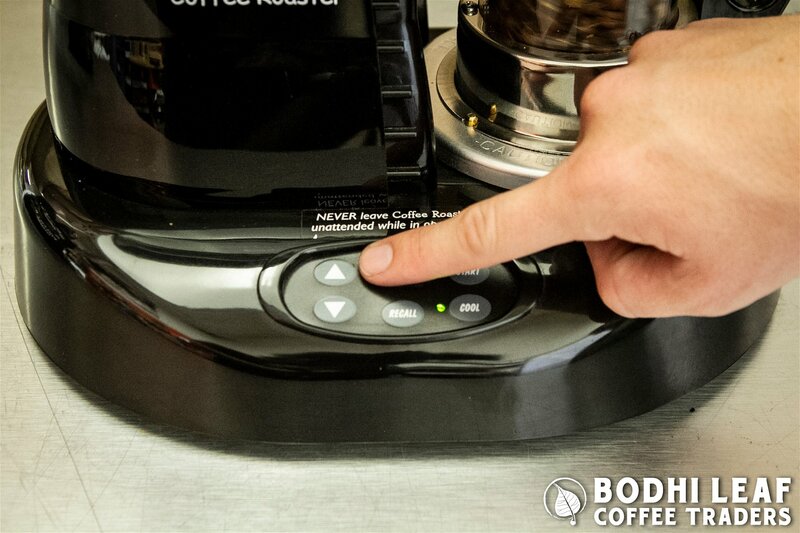 PLEASE THOROUGHLY READ YOUR MACHINE’S MANUAL AND USE THIS GUIDE ONLY IN COMBINATION WITH THE MANUAL. 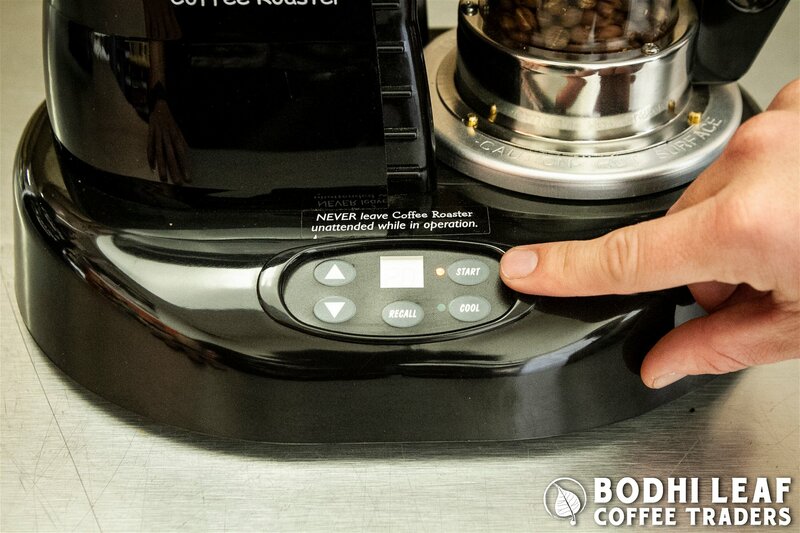 BEFORE ATTEMPTING TO ROAST WITH ANY MACHINE, IT IS VERY IMPORTANT TO THOROUGHLY READ THE MANUAL PROVIDED. 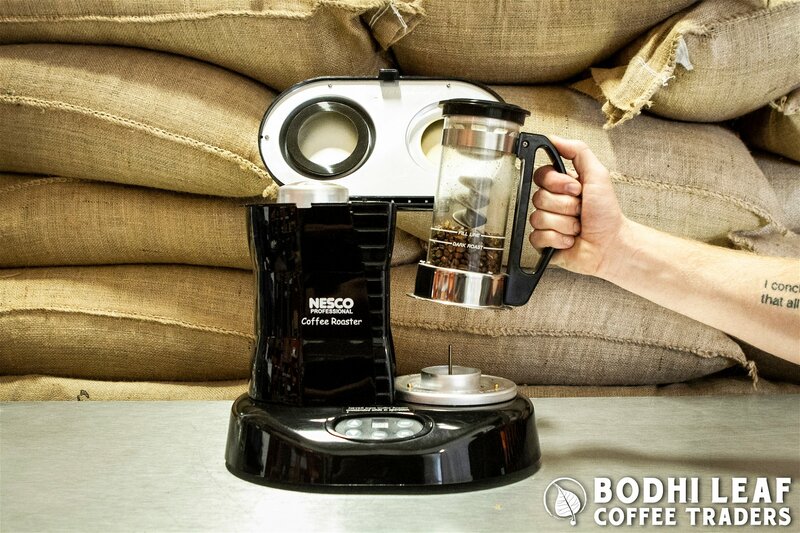 ROASTING COFFEE CAN EASILY LEAD TO FIRES AND INJURY IF NOT USED PROPERLY SO SAFETY IS EXTREMELY IMPORTANT! 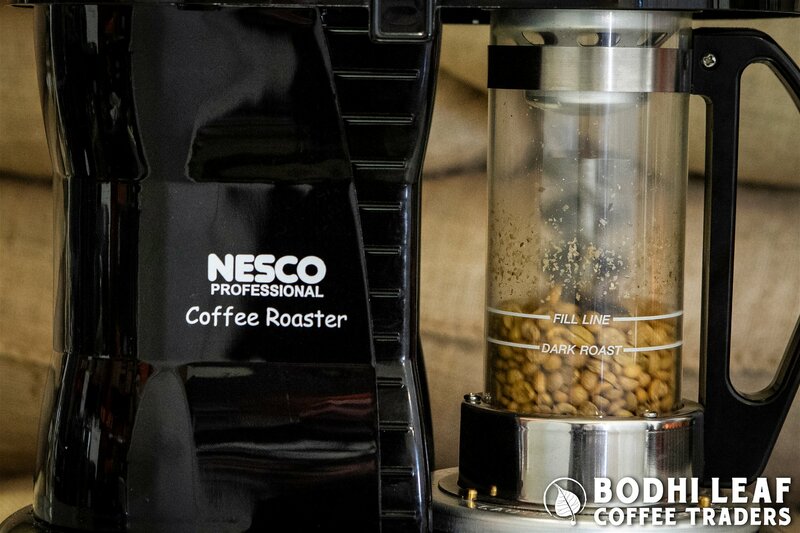 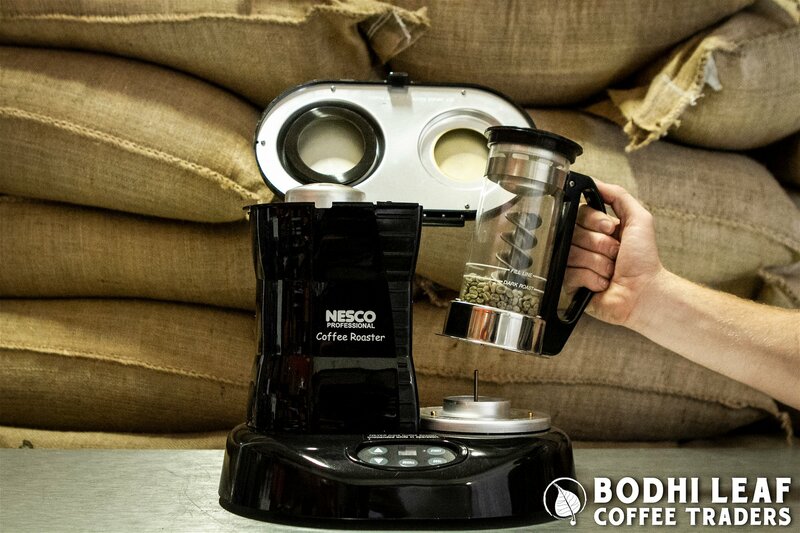 THIS ROASTING GUIDE WILL COVER THE BASICS OF ROASTING ON THE NESCO CR1010. 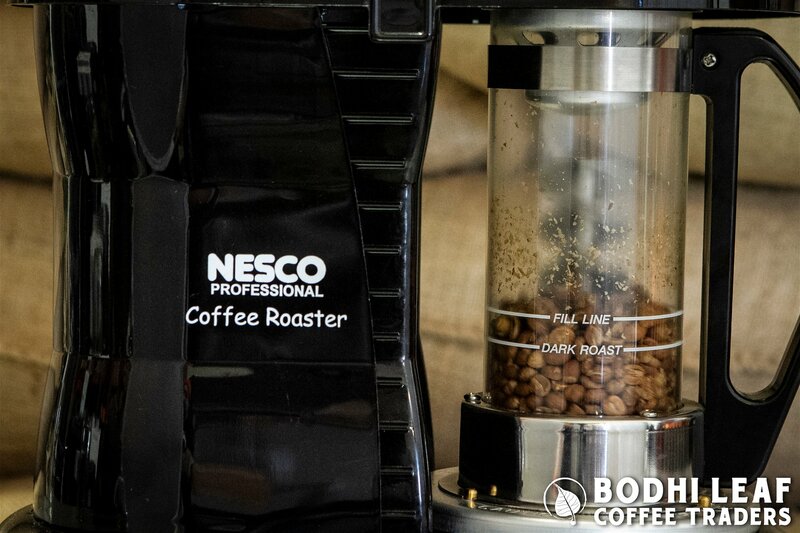 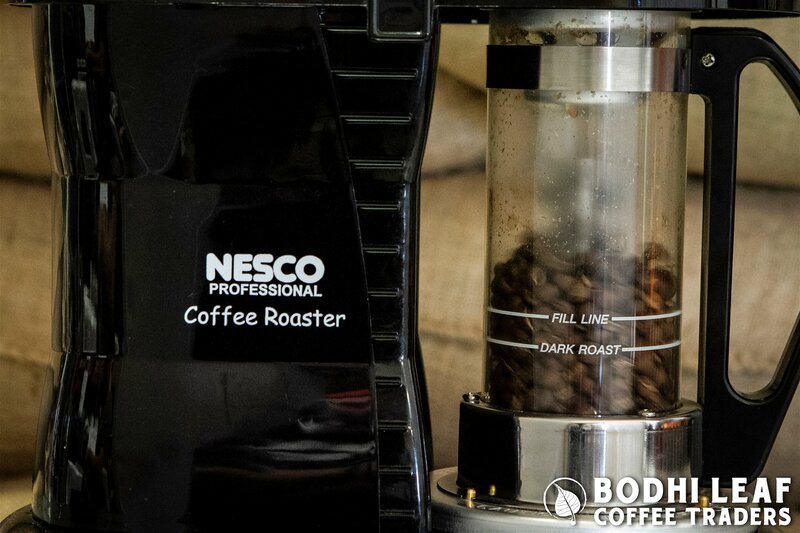 FOR MORE IN DEPTH INFORMATION, MAKE SURE TO READ OUR BODHI LEAF NESCO CR1010 ROASTING TIP SHEET. 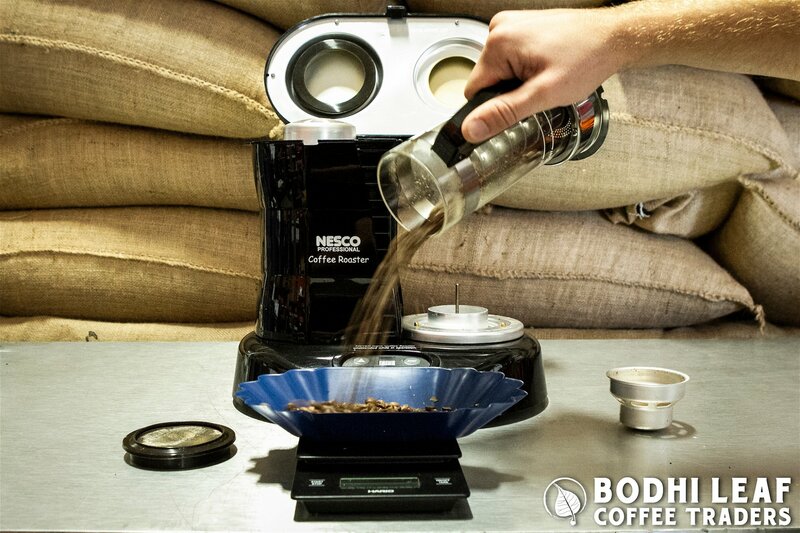 WEIGH OUT DESIRED AMOUNT OF GREEN COFFEE. THE NESCO ROASTER HAS A CAPACITY OF 5OZ OF GREEN COFFEE, BUT WE RECOMMEND ROASTING WITH 4OZ OF GREEN COFFEE FOR MORE EVEN ROASTS. 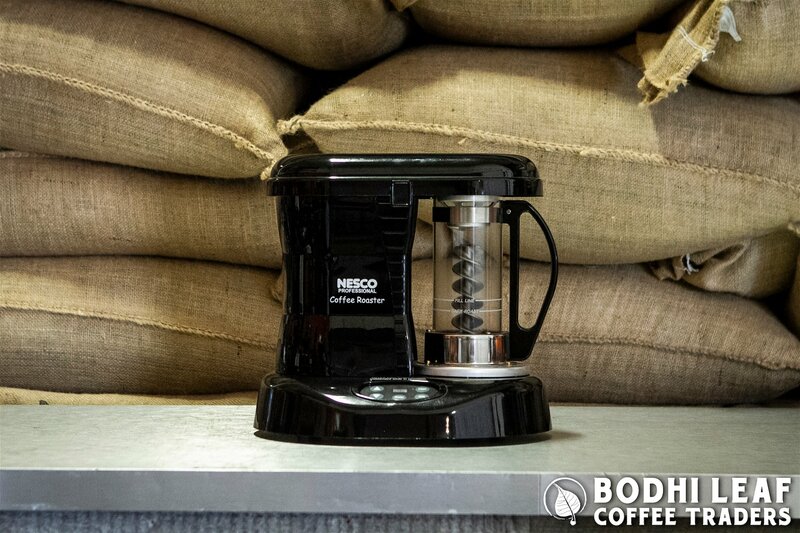 THE NESCO HAS A “FILL LINE” AND A “DARK ROAST” LINE. 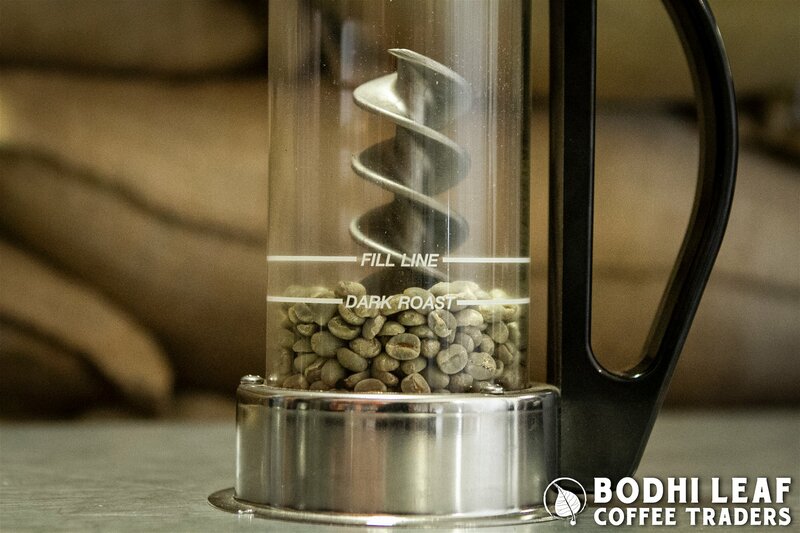 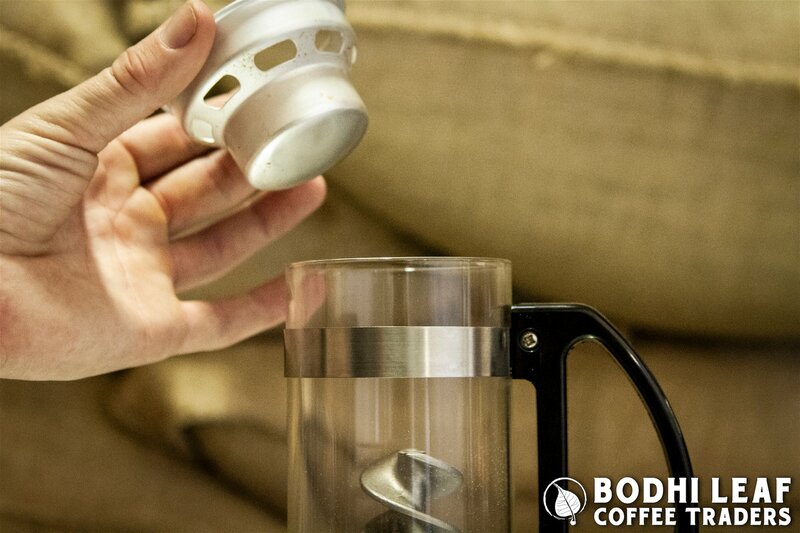 WE RECOMMEND ALWAYS ROASTING BY WEIGHT, RATHER THAN FILLING TO THE LINE ON THE MACHINE. 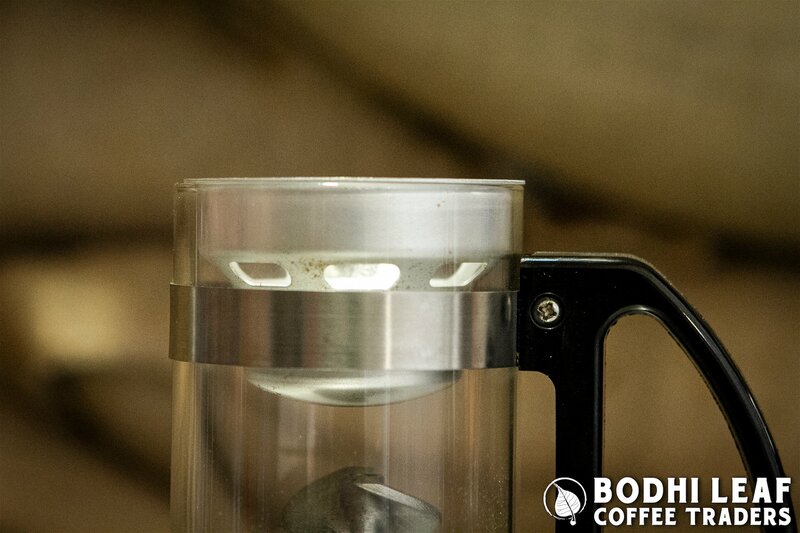 REMOVE THE GLASS ROASTING CHAMBER FROM THE MACHINE AND FILL WITH GREEN COFFEE. 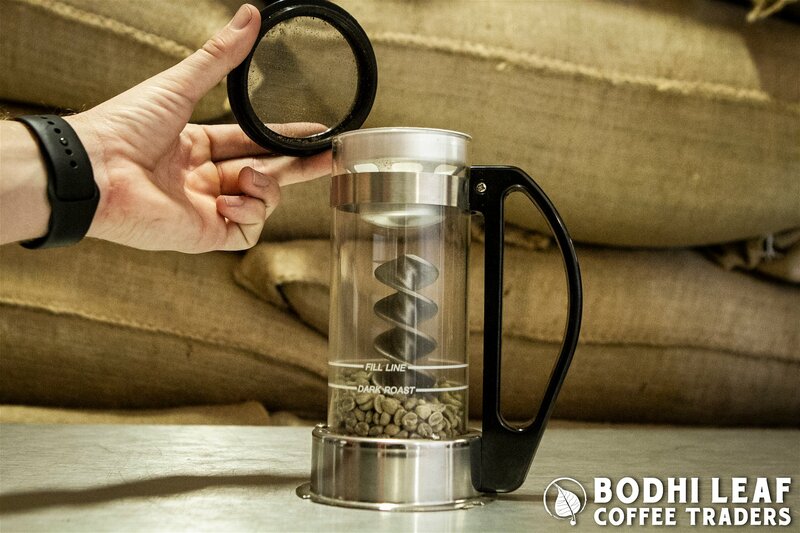 GENTLY PRESS COVER DOWN UNTIL IT LATCHES IN PLACE. 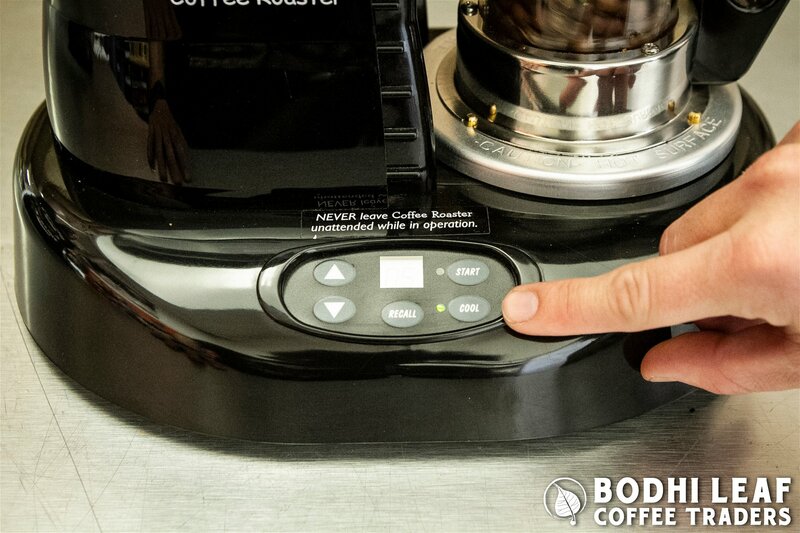 NOTE: IF THE COVER IS NOT SECURELY LATCHED, THE SAFETY CUTOFF SWITCH WILL NOT ALLOW THE ROASTER TO OPERATE. 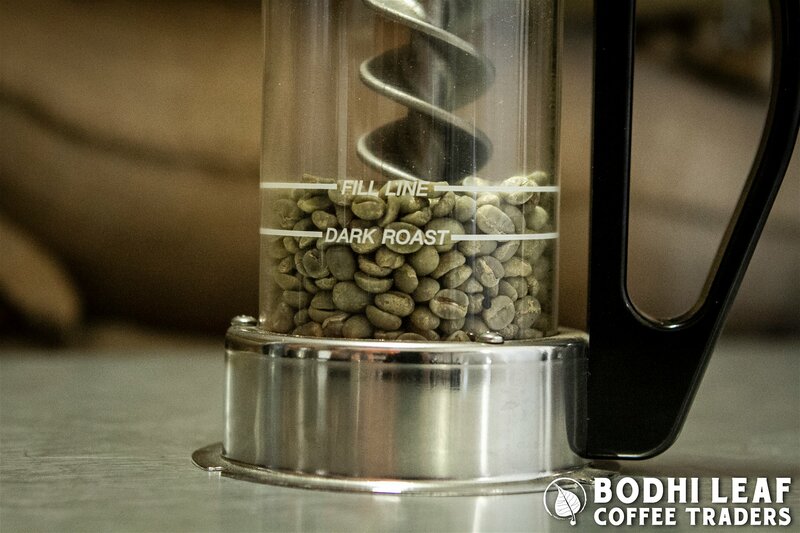 ADJUST ROAST TIME USING THE “UP” ARROW TO ADD MINUTES OR “DOWN” ARROW TO SUBTRACT MINUTES FROM THE ROAST CYCLE. AFTER YOU SELECT THE TIME FOR THE ROASTING CYCLE, PRESS THE START BUTTON. 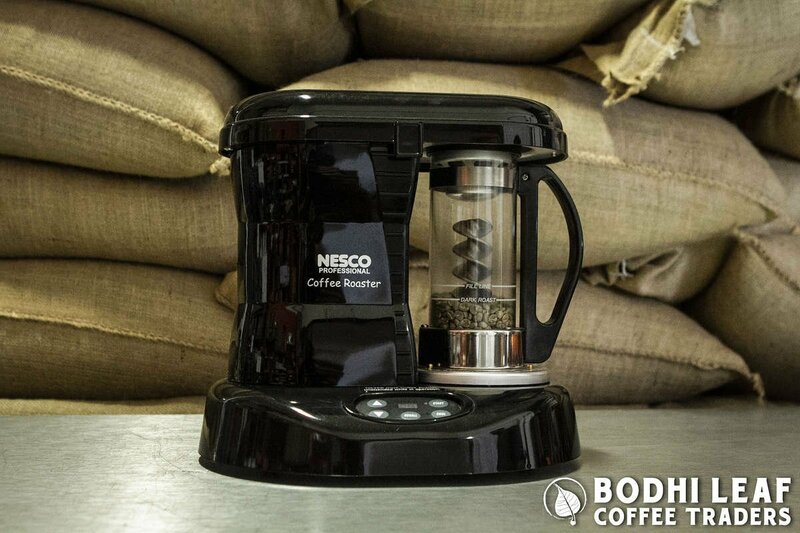 THE AUGER WILL BEGIN TO TURN THE COFFEE BEANS AND THE FAN WILL START. 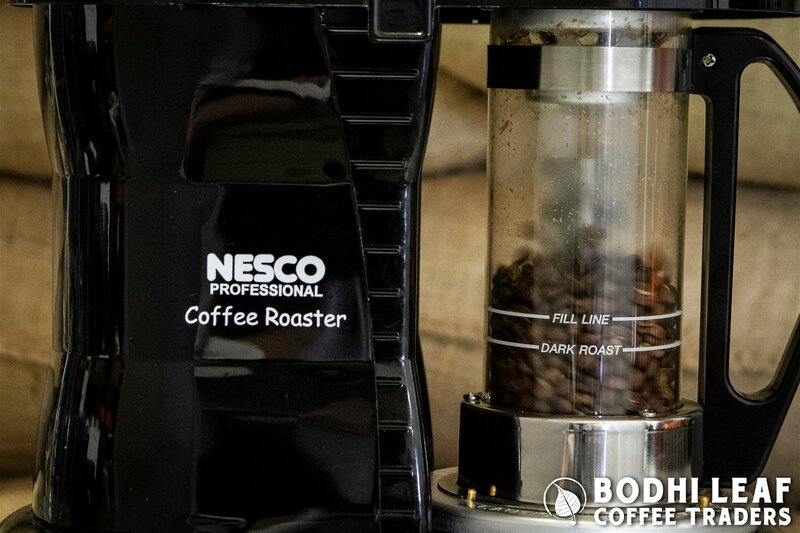 AND THE ROASTING CYCLE STARTED. 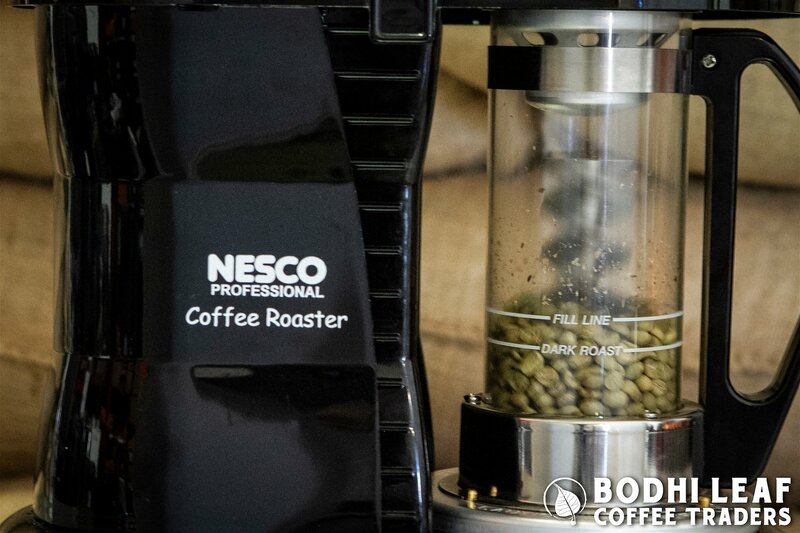 NOTE: PRESSING THE COOL BUTTON AT ANY TIME DURING A ROASTING CYCLE WILL STOP THE ROASTING AND BEGIN THE 5 MINUTE ‘COOLING’ PROCESS. WHEN YOUR ROASTER HAS COMPLETED THE COOLING CYCLE, THE APPLIANCE WILL TURN ITSELF OFF AUTOMATICALLY. 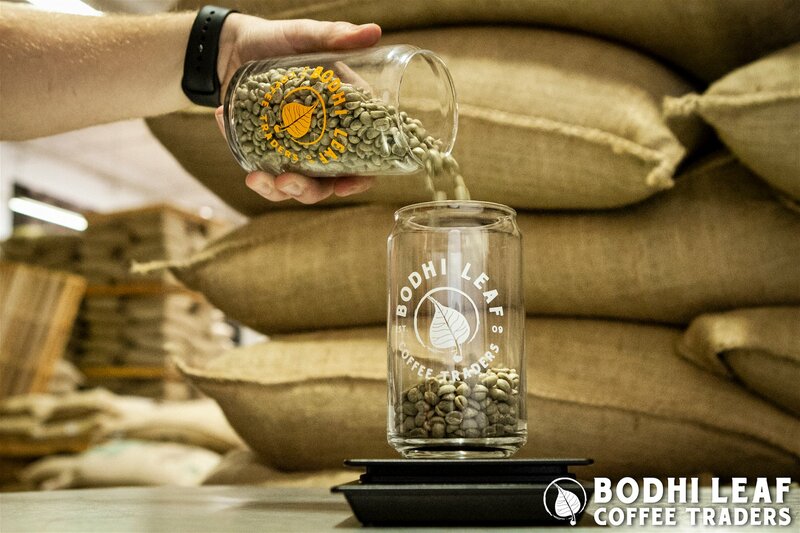 LET THE ROASTER COOL FOR AN ADDITIONAL 10 MINUTES, THEN OPEN THE ROASTER COVER BY PULLING THE PLASTIC TAB TOWARDS YOU WHILE LIFTING UP. 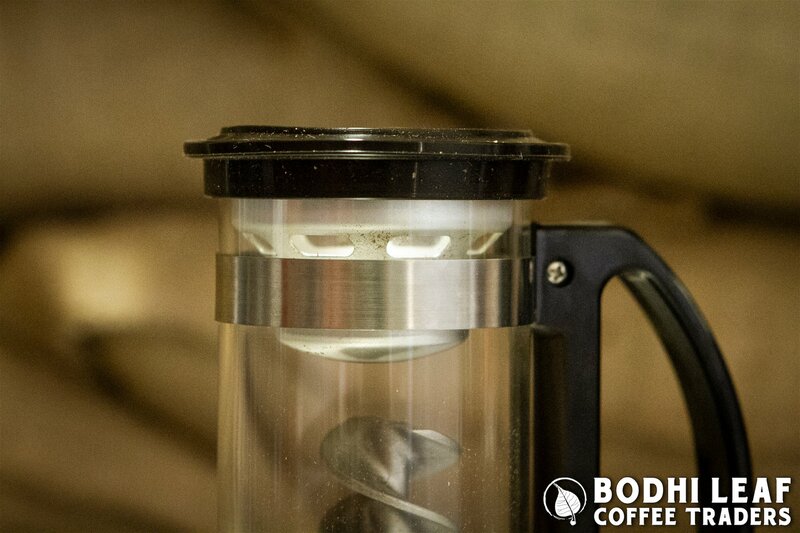 REMOVE THE FRONT SEAL WITH SCREEN AND CHAFF CUP. 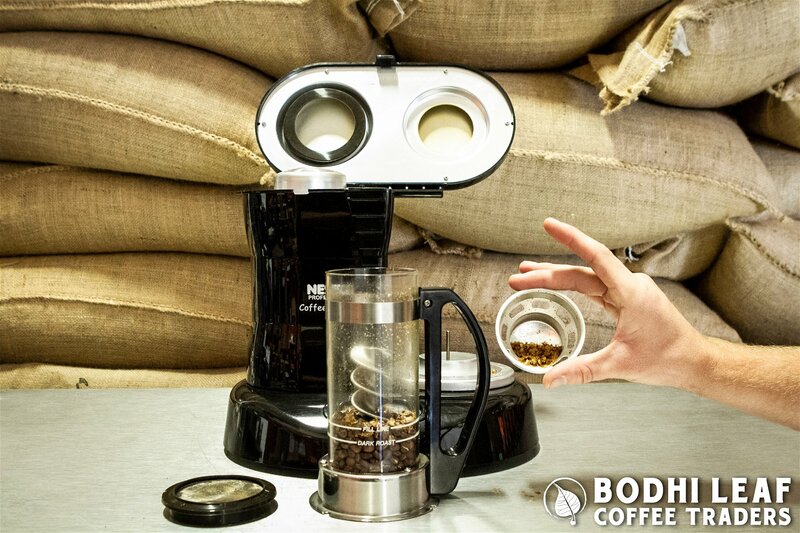 REMOVE CAPTURED CHAFF AND DISCARD. 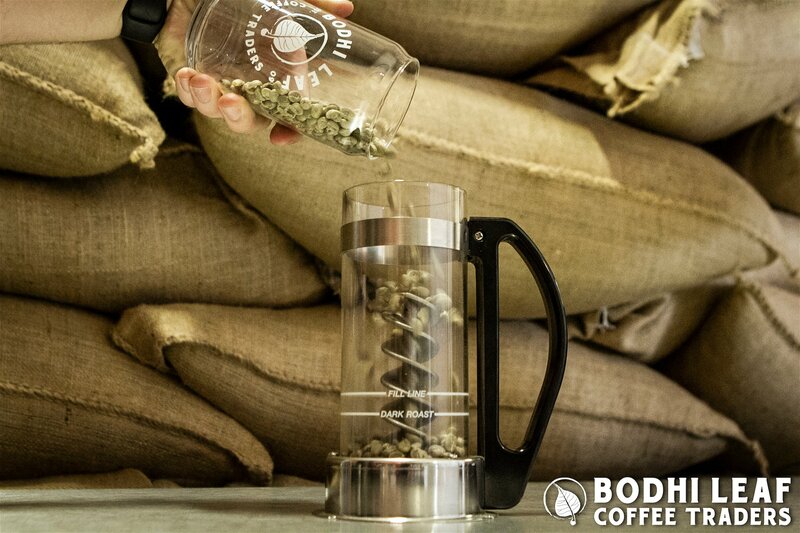 AFTER THE ROASTING DRUM HAS COOLED SUFFICIENTLY, REMOVE THE DRUM, WEIGH OUT THE ROASTED COFFEE AND NOTE YOUR RESULTS ON YOUR BODHI LEAF ROAST LOG.